The effect of modern thermal imagers has been ignored in modern infantry tactics. American soldiers proudly claim "we own the night," but a future opponent may buy the night too. The cost of advanced thermal imagers (also known as infrared devices) has fallen rapidly and are produced by many nations around the globe. Since they can be ordered through the mail, all infantrymen must prepare for their use. Thermal imaging is also extremely valuable in fog and rain. 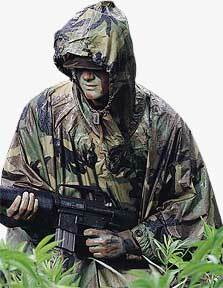 The solution is a combat poncho made of insulated materials to mask body heat. A loose poncho is best since a parka fits tightly around the body where it absorbs heat, while a loose poncho allows the heat to dissipate out the bottom. The outer layer may consist of waterproof Gortex fabric with Mylar insulation, extra thick around the "hot" head, shoulders and chest. Ponchos also cover web gear and other items to provide superior visual camouflage. Combat ponchos cannot make infantry invisible ninjas, but they should be able to hide most of their infrared signature so they can only be detected at perhaps 50 meters rather than 500 meters. A disciplined infantry unit in defensive positions can hide under the cover of their combat ponchos from enemy reconnaissance probes. A moving unit would be difficult for aircraft to detect. Faces and hands may be partly exposed, but they produce small irregular images which are difficult to interpret compared the obvious body image of an uncovered infantrymen. Many modern ponchos also double as tents. Since combat ponchos will be thicker, they can be designed for use as tents, and maybe zip up as light sleeping bags too. A thick water-proof poncho can also provide emergency protection against chemical attacks until proper protective clothing is donned. Today's soldiers understand the value of visual camouflage and consider the 18th Century armies wearing bright red as just ignorant. Future soldiers are likely to view today's soldier's failure to wear ponchos to mask their thermal signature as equally ignorant. Combat ponchos are not needed for many future conflicts with primitive soldiers. However, every modern army must field combat ponchos to fight serious opponents in future wars.